Are exhaust fans, vehicle exhaust systems, or smoke evacuation systems critical parts of your facility’s infrastructure? At Garrison Mechanical, we offer services for your commercial air ventilation system or we can replace the unit entirely if it’s not serving its purpose. When people think of HVAC they typically just think of heating and air conditioning, but proper ventilation and air balancing are frequently overlooked critical components of HVAC. Poor ventilation can lead to serious problems, which is why it essential to install and maintain the ventilation systems in your facility. Garrison Mechanical provides service and repairs to keep your commercial air ventilators in optimal working condition. We commonly service exhaust fans, vehicle exhaust systems (for fire stations), and smoke evacuation systems (triggered as part of fire alarm systems). Bathrooms: Exhaust fans are useful in bathrooms, where a great deal of water is used. An exhaust fan will help eliminate odors. It will also help remove the moisture within the room to reduce potential problems such as mold. Commercial Kitchens: A kitchen exhaust fan helps removes odors, smoke, grease, and moisture from your kitchen. Industrial Facilities: Industrial facilities require exhaust fans to keep products cool and dry and production standards high. 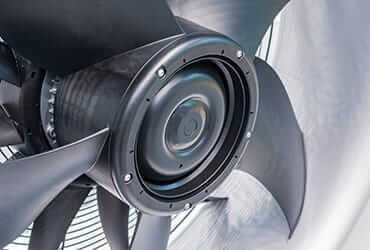 Exhaust fans in these commercial spaces or warehouses can also prevent stale or noxious air. Hospitals: The air inside a hospital can contain pollutants, allergens, and unwanted moisture from outside air. Air quality is extremely important in hospitals to keep patients in optimal health and improve their healing experience. Exhaust fans circulate the air for better air quality in hospitals. Vehicle Exhaust Systems—We commonly work on vehicle exhaust systems to ensure there is clean air in the work environment of vehicle mechanics and firefighters. Large diesel engines used in fire trucks emit toxic gases and particulates from the combustion process. The hazardous vehicle exhaust emissions are a huge health risk for firefighters. Vehicle exhaust fans create healthy and safe working conditions. Smoke Evacuation Systems—Smoke evac systems can be used in large commercial facilities to trigger the fire alarm system when there is smoke present. We work with Sawgrass Mills Mall in Sunrise, Florida, to provide services for their smoke evac systems. 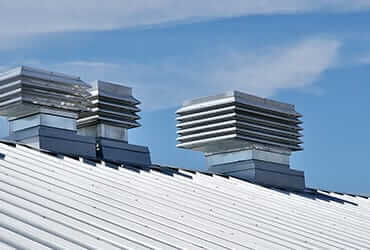 Garrison Mechanical services and repairs ventilation systems for cleaner air in your South Florida commercial building. When performing services for ventilators, we work with reputable brands, including Greenheck, Penn, American Coolair, and Ruskin. If you are considering a construction project for a new facility, we can also install brand-new equipment. We offer turnkey solutions for all of your HVAC needs. By working directly with vendors such as engineers, construction companies, and designers, we are able to streamline the process and install your new equipment in a timely manner. We ensure that your building comes together nicely and that mechanical ventilation is installed according to design plans. For quality repair and service for your commercial ventilation systems, we have you covered. At Garrison Mechanical, we are HVAC experts. There is no better team to call for your commercial air conditioning and ventilation needs in South Florida. We will keep your air quality high and the temperatures cool for optimal comfort year round. Contact our team today to learn more about our ventilator services.